The issue of the HCEI Energy Agreement and Big Wind popped up at DBEDT’s 3rd Asia Pacific Clean Energy Summit & Expo (APCE) held at the Hawai`i Convention Center this month. The mantra of the Hawai`i Clean Energy Initiative (HCEI) is that we need everything. Within the details of the HCEI proposal, some things are included, some are excluded, some are fast tracked, and some have been included but then altered or eliminated. And yet, the rifts were obvious. Wind versus geothermal. Ocean thermal versus solar. And there were even battles within sectors. This wind generator versus that one. Utility-scale photovoltaic versus distributed rooftop photovoltaic. There are those who believe that Hawai`i could be 100% energy self-sufficient using only Ocean Thermal Energy Conversion (OTEC); or only relying on Ocean Wave Energy Systems (WEC); or by using a combination of wind, solar and batteries. Some scientific types believe that the only reason for saying we need everything is to avoid taking a "hard look" at alternatives. If all technologies were laid side-by-side and analyzed in terms of reliability, risk, cost, local production, community values, climate impacts, etc., some projects would be accepted and other projects would be rejected. Hawai`i has had some experience where bad projects have been placed at the head of the queue, and arguments were made that since we need everything they should be automatically approved by regulators. For example, palm oil biodiesel is often made from palm oil plantations clear-cut from tropical rainforests. The plantations have devastating environmental, social, cultural and climate impacts. Obviously the amount of solar energy falling on O`ahu can power the entire state and perhaps most if not all of California. But questions remain regarding how much solar energy can actually be captured on Oahu. The Naval Facilities Engineering Command (NAVFAC) Pacific published a Request For Proposals (RFP) for private industry to build, own and operate solar facilities on Hawai`i military bases. In Hawai`i, new 5 MW solar farms on non-military land are in the regulatory stage for Kalaeloa facilities and in the planning stage for central O`ahu facilities. Research teams led by University of Hawai`i’s Steven Meder have studied in detailed the roof characteristics of the Iwilei industrial area; the University of Hawai`i, Manoa Campus; and Coconut Island. Sempra is building the 8 turbine Auwahi Wind Farm with a 10 MWh battery storage system at Ulupalakua Ranch on Maui. Sempra has built the largest solar farm in the U.S. The 48 MW Copper Mountain Solar facility is located in Boulder City, Nevada about 40 miles southeast of Las Vegas. 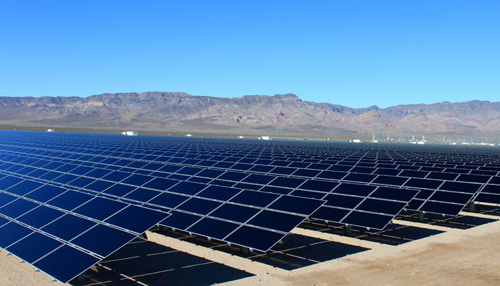 Sempra is in the process of building the world’s largest solar farm. The 150 MW, 4000 acres (6 square mile) Mesquite Solar Complex in located in Arlington, Arizona about 40 miles west of Phoenix. Sempra proposed to the Navy that Sempra invest $1 billion to build a 300 MW photovoltaic solar facility on unused land at Pearl Harbor to be located on unused military land that the military may wish to land bank for future military expansion. Sempra is also proposing to build a 50 MW solar farm facility at Lualualei. For the 300 MW solar farms at Pearl Harbor, Sempra is proposing to give the military 25 MW of the electricity at no cost in exchange for the use of the Navy property and charging HECO 17 cents per kilowatt-hour for the other 275 MW. HECO estimates the wholesale cost of Big Wind to be 21 cents per kilowatt-hour. Although the Sempra proposal in not in accordance with the Navy RFP because the proposal involves only ground-mounted systems, the Sempra proposal expands the envelope of what can be done on O`ahu. There was also an unusual leaflet found at the conference called the “HCEI Road Map: Introduction & Overview, 2011 Edition” published by DBEDT. The document stated in a few places: “see Road Map” for more details without any address or website to get such a Road Map. Going to the DBEDT web site produced no meaningful results. I finally located the August 2011 Road Map on a federal website. Odd, since HCEI meetings were frequently held behind closed doors without public notice and I had to petition DBEDT last year to find out who the members of the committees were. The panel on “Foundation for Clean Energy Future - Policies, Strategies, and Frameworks That Transform the Energy Market “ provided an opportunity for Senator Mike Gabbard, PUC Chair Hermina Morita and HECO VP Robbie Alm to discuss their ideas. After they spoke, the audience asked questions. 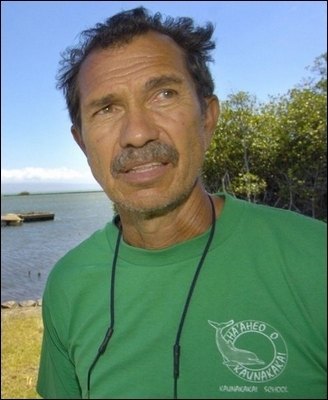 “My name is Walter Ritte, and I'm from Moloka`i, which is the first wave of, this energy stuff coming that need to feed Oahu. So I was really agreeing with a lot of things. I like all of your analogies of being addicts. The question I have is for the policy makers. I wanted to know if there was a political will, on the part of the State, to sort of level the playing field about, who's going to sacrifice what, in order for us to get, these things that we want to get. Right now their asking us on the island if Moloka`i and the island of Lana`i, to sacrifice, our social and cultural values in order to get to where we want to go. I wanted to know if there's a political will on the part of the Legislature, to have the people of Oahu, sacrifice some of their social ways of living, because the talk we have on the Outside Islands is why should we, keep feeding the beast, it's going to be endless. It's not a matter of being addicts to black oil or green oil. It's a matter of being addicts to power and being wasteful. So, that's how we talk on the Outside Islands. We would share, but, it has to be a two-way street. 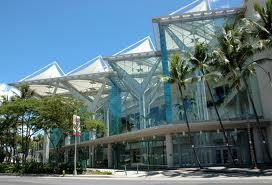 Lockheed Martin had been planning on deploying an OTEC facility in the waters off Hawai`i next year. Instead they have sought to lock in 5 years of taxpayer funded Stimulus funds to conduct more research and to patent the results. OTECorporation is moving aggressively into building OTEC in the Caribbean. There is concern by OTEC proponents regarding a new rule being proposed by the U.S. EPA. The rule is focused on manufacturing facilities and power plants located along ocean, river and lake shorelines but may adversely impact an ocean-based OTEC facility. Since 2001 the U.S. EPA has been adopting rules to regulate cooling water intake structures (CWISs) under the Section 316(b) of the Clean Water Act re the National Pollutant Discharge Elimination System (NPDES) permit system. The EPA is working on a new proposedfinal rule that would cover roughly 1,260 existing facilities -- 590 manufacturing facilities, 670 power plants -- that each withdraw at least 2 million gallons/day of cooling water. Under the terms of a lawsuit settlement agreement the final rule must be signed by July 27, 2012.